Tens of thousands businesses are using email marketing every day as it has benefits that are very hard to beat. Let’s have a look what make email marketing the best digital marketing channel. There are 1.65 Billion Facebook users in the world. Along with 310 Million active Twitter users they add up to 1.96 accounts. Email is even more impressive. At the moment there are 2.7 Billion email users worldwide and by 2020 their number will reach half of world population. Now you can imagine the audience of this single marketing channel. You should send emails to people who already know something about your product or service. They left you their email address and thus showed some interest in you offering. All these people are your leads and email marketing is exactly the way to convert leads into customers. In comparison with other marketing channels the direct costs associated with email sending is close to nothing. You don’t have to create and produce marketing materials (like booklets or TV ads), you don’t have to pay for advertisement, and you don’t have to produce expensive content. The only investment here is the cost of your content marketing or the extra price which marketing automation platforms charge for advanced functionality. But you can decide what kind of functions you need and find a suitable product. 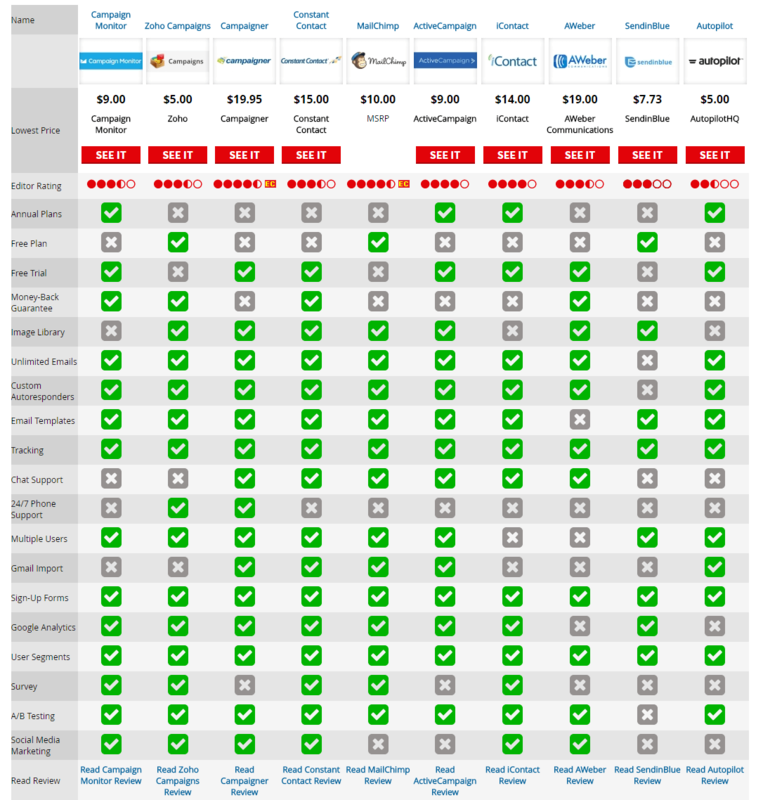 In the market there is a truly wide choice of email service providers. You already know that, in most of the cases, you will use email marketing for people who already showed some interest into you, gave you their email and turned into leads. Plus cost of email marketing is low in comparison with other channels. These two things together can give high ROI: 60% of marketers acknowledge that email marketing produces ROI for their companies. If you still don’t know ROI of your email marketing campaigns, you can use ROI calculator here. Times when you had to have HTML coding skills to create colorful and eye-catching email templates are long gone. With the rise of drag-and-drop email editors you can jazz up your email with all images, gifs or even videos. Email marketing campaigns are really easy to track. You can see immediately what kind of impact your email blast produced by tracking open and click through rates. Moreover, don’t forget to tag the links in your marketing campaign so that you can track how many visitors it brought to your web-site. As emails are really easy to create and set up, email marketing gives you a unique opportunity to react quickly to some news and offer your customers a limited time deal in connection. 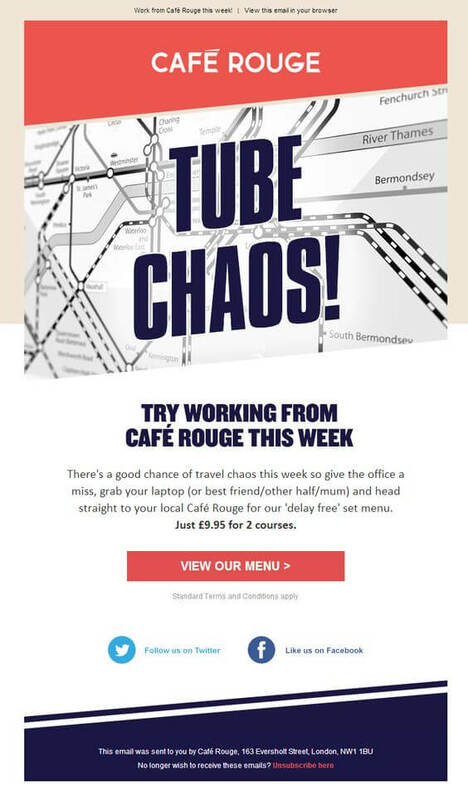 Like this café who launched a promotion in reaction to Tube strikes. Email marketing targets people who are already interested in you. But all these people have different fears, uncertainties and doubts concerning your products or services. So you can go one step further and segment your subscribers list based on certain criteria and then customize your email messages to target these segments. By segmenting your subscriber base and tailoring email campaigns for each segment you can make your messages more relevant for your leads or customers. Segmented email campaigns gain 14.5% higher open rates and 63.71% click rates than non-segmented ones. Personalization increases relevance of your email campaign even further. Proper personalization goes beyond simple mentioning of your customer’s name or referring to recent purchase. It should include all you know about your customer: purchase history, preferred purchase channel, price sensitivity, etc. Personalized marketing campaigns are 26% more likely to be opened and bring up to 760% increase in revenue. If you send coupons, deals or offers via email to your customers to retain them and convince to make another purchase, it is a good idea to make these coupons sharable, so that they can refer you to their friends and family and increase your customer list this way. Email automation is great. You can set up automated emails that users of your website will get as soon as they perform some action on your website (signing up, registration, purchase). You also can use automation to set up emails reminding your users that they have not completed certain action (abandoned shopping cart, incomplete registration process etc.). Or you can use automation to nurture your leads after you segment your subscribers in micro niches and create a personalized email for each of them. For instance, Home Depot reached great results by creating 120 micro segments to target different group of customers. Appealing calls to action in email marketing can do miracles. There are only few marketing channels that allow people to go and buy things immediately after they see them. Email marketing is one of them: you can buy a thing you like in a couple of clicks especially when links in your email lead straight to checkout. Email is a relatively conservative thing in terms of coding, but you can use interactive content as well. There is still no reliable way to embed videos in your emails, but they can be easily replaced by GIF files that add element of delight to your marketing campaign and **can increase click through rates by **26%. As you can see from all these things written above, email marketing campaigns can help you to increase sales. You can send a “new arrival” email with promotion code, you can send a sale notification with extra discount offer, or launch a promotion campaign to make your customers to return back to your website. Sending emails with relevant content to your customers at a regular interval helps your business remain top of mind for your customers. 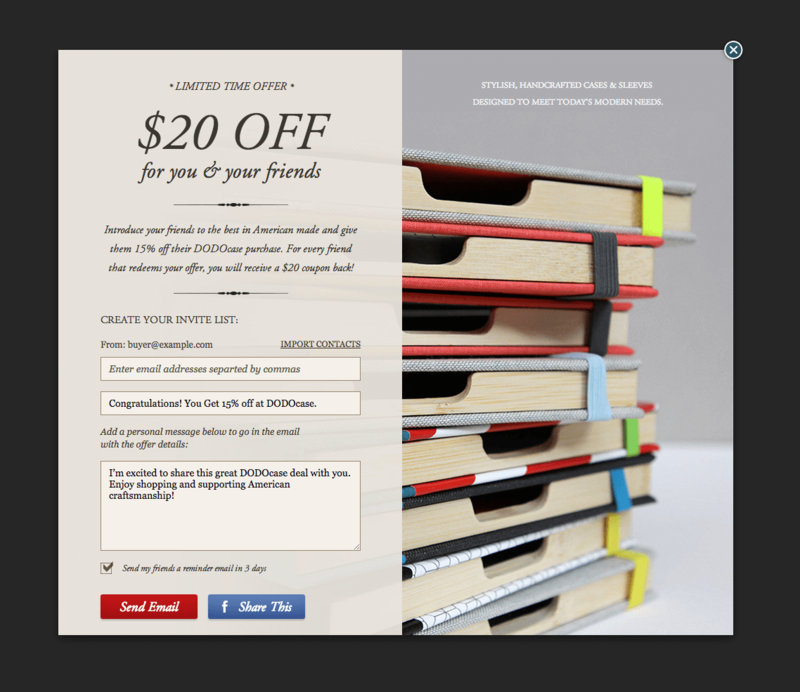 Newsletters, holidays emails or birthday greetings are gentle reminders to your customers about your business. Email is a perfect tool to nurture relationship with your leads or customers. It is provides a quick channel to distribute valuable content such as invitations to events, industry news, offers, or product tips. You can also send them reminders, discounts, coupons, whatever to reactivate existing contacts on your list. Do you think we missed something? Please add your tips as comments!